Why are B.C.’s carbon emissions still climbing? Rumour has it, during one winter vacation in Hawaii, Premier Gordon Campbell read Tim Flannery’s The Weather Makers. That, combined with an eye-opening trip to China and the stark realization about the challenges (storms, pine beetle, forest fires) his province was facing, initiated a change in thinking for Campbell. Campbell introduced the carbon tax. He started working towards a carbon neutral government. He legislated ambitious targets for greenhouse gases: 33 per cent reduction in emissions by 2020; 80 per cent reduction by 2050. Yet here we are, two years out from that 2020 target, and not much further ahead. And thanks to Sierra Club BC, last week we found out that while the rest of the world tackles climate change, B.C. has actually increased our emissions in four of the past five years. By the government’s own admission, B.C. has only lowered our emissions by 2.6 per cent since 2007. And that’s without counting forest fires, which last year released three times more carbon dioxide into the atmosphere than all human activities in the province combined. Why doesn’t B.C. count wildfires in our overall emissions? Because until the 2000s, B.C.’s massive forests functioned as a “carbon sink,” pulling CO2 out of the atmosphere as trees grew. The pine beetle — propelled north by a warming climate — threw off that delicate balance. These days our forests lose more carbon every year to fires than new growth is able to absorb. However politicians choose to count carbon, the reality is clear. We will not meet our 2020 target, making it that much harder to hit our 2050 target… Meaning more forest fires, more flooding, more infestation, more climate devastation. How did we get so off track? Gordon Campbell may have started the Climate Action Plan, but it was up to his successor to maintain the momentum. Unfortunately the B.C. government under Christy Clark simply did not take the climate crisis seriously — instead courting the province’s biggest polluters to write policy, advise the Premier and fund the BC Liberal Party. Like her predecessor, Clark set ambitious targets for the province as well — by 2020 she wanted to have three LNG plants in operation. She had no words to add about how this would be compatible with the province’s climate targets. Because it wasn’t compatible. 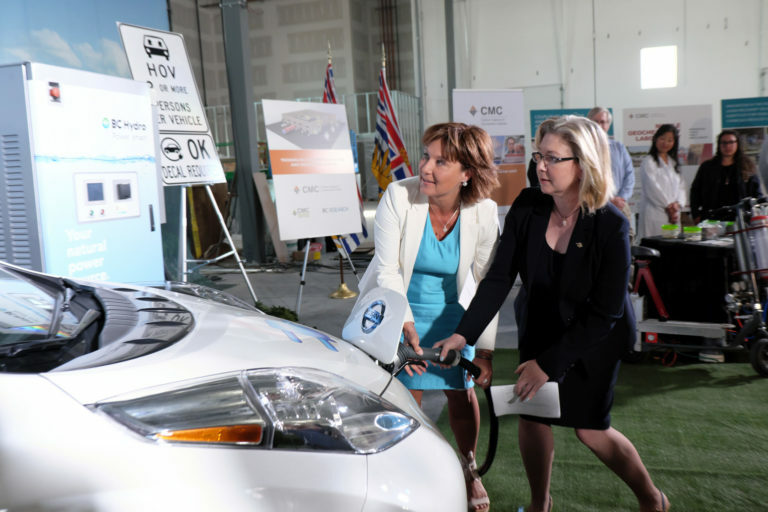 One project alone, Pacific Northwest LNG, could have raised B.C.’s emissions by 14 per cent. Just one project! Fortunately, the Chinese and Malaysian state owned project was cancelled. In fact, thanks to an unstable global LNG market, no construction has started on any of the LNG facility proposals and several have been cancelled. Yet fracking in northeastern B.C. continues, producing 118,000 tonnes of methane per year, a greenhouse gas 84 times more potent than carbon dioxide. This begs the question: if the economic prognosis is so bad and the industry is terrible for the climate, why would Clark prioritize LNG? You probably know where I’m going with this. The LNG industry donates to the BC Liberals. And with John Horgan on his way to Asia this week to talk about LNG, we may have some similar questions for him as well. How about that oil tanker expansion? Kinder Morgan’s pipeline and tanker expansion project was approved by Christy Clark more than a year ago. She declared that the pipeline met her “five conditions,” including the successful completion of an environmental assessment. But this assessment was completed by the industry-captured National Energy Board for the federal government and accepted by B.C. without further questions. The environmental assessment does not include downstream emissions coming from when it actually gets burned overseas. Including that number? Emissions are estimated to be 10 times higher than the upstream emissions from the oil’s extraction the government does count. So basically, the environmental assessment did not consider the lion’s share of the pipeline’s emissions, and the provincial government just went with it. Why? Because Christy Clark was too busy fundraising from Kinder Morgan and industry friends to pay attention to little details like the climate. We don’t know if these donations bought Clark’s approval, only a Corruption Inquiry can tell us that. But here are the facts: the biggest oil companies in the country contributed to the BC Liberals’ campaign, including Canadian Natural Resources, Suncor and Nexen. Then Premier Clark approved the pipeline for their product. You connect the dots. I could go on citing examples of big polluters who were publicly propped up by Premier Clark’s government, and privately wined and dined at BC Liberal fundraising dinners, but I think the most illustrative example is B.C.’s Climate Leadership Plan. The plan was delivered in Summer 2016 with all the bells and whistles the government could muster, perhaps to distract from the hollow outline of the province’s climate agenda and the blatant pandering to industry donors. At the time, we anticipated donations were to blame for the intentional disregard for Clark’s own climate team’s recommendations and neglect of scientific evidence — we called it a “thank you note to BC Liberal industry friends”. But the truth was even worse. B.C.’s Climate Leadership Plan was literally written in Big Oil boardrooms in Calgary. It wasn’t just a thank you note, it was a love letter. And, you guessed it, those in the room were not just friends, but big donors. B.C.’s emissions are 10 per cent higher than they were in 1990. By comparison, the European Union has lowered emissions 23 per cent since 1990. Our politicians wasted precious years heading in the wrong direction, and now time is running out. We should all be livid about the previous government’s complete lack of regard for the future of this province — and for this planet. After an election, it is easy to shed the past government like a snake sheds its skin and move on. But the reality is that we are going to live with the consequences of the previous government’s decisions for decades to come — in fact, we already are. We’ve just survived a record setting summer — rainfall, hot weather, floods, fires — and it just gets worse from here on out. It’s easy to put all the blame on Christy Clark’s BC Liberals. They were, after all, the government in power when our province’s climate action started slipping. And they were also the party holding $20,000 per plate cash-for-access fundraising events with the same people they were in charge of regulating and awarding contracts to. But Horgan’s NDP now has to assume the mantle and all the responsibility that comes with it. This means stopping Kinder Morgan — and prioritizing real climate action over cozying up to the fracking industry. In the meantime, we deserve to know for sure if Christy Clark prioritized her campaign donations over the realities of climate catastrophe — over our homes, our safety, our health and our environment. If that evidence can be brought to light, British Columbians deserve justice. We need a Corruption Inquiry. Sign the petition here. Let’s ALL speak up and get ride of every Canadian politician who bends over for horrible Mega Corporations who pay the Mega $$$s in their offshore accounts. These are not leaders, they are criminals! I have written letters to local papers and said that what needs to happen is that the site C should be cancelled and instead build a generation IV nuclear reactor as China is now doing. Perhaps China could build one for us. This could be built on the sea coast and used to extract CO2 from sea water and made into pure carbon, as the US navy is now working on; only they are working on the manufacture of jet fuel. With the abundance of nuclear energy, this is doable. It is not a pipe dream; Google it. None of this is news of course. It has been going on for decades. We need people to start paying attention at the larger scale or we will be fighting these problems on an issue by issue basis for decades to come. It hasnt been very effective kin the past (or we wouldn’t still be fighting). Reminds me of the oft quoted “banging you head… “. Organisations need to cooperate on campaigns and funding to tackle the magnitude of the problem. I agree it would be a goog idea to have a corruption inquiry,. However it is unclear to me that that individual action will likely change future actions by a different government for any lasting timeframe. Cooperation is perhaps the most powerful tool available to us. It is csrtainly working for the industrial multinational group of folks…they do have something to teach on that front. Lets spend our limited funds on the mkost effectve tool we have.